As a Matter of Fact, I Have Come to Enjoy the Poop! Proverbs 14: 4 Where no oxen are, the crib is clean (from food, water and poop); but much increase is by the strength of the ox. God is looking for good leaders more than He is for good ministers. There are many ministers and ministries. Good leaders are hard to find, though. God is looking for problem solvers. Many will see the problem but few will get their hands dirty to solve it. If we are only looking for the success of our ministry without first becoming a good leader in it, we will miss God’s higher purpose. The church is full of people who rightfully see the problems but will do little to solve them. Solutions come through forgiving, relating, sharing, praying, getting dirty in people’s poop, confronting, a willingness to also be wrong and learn, sacrificing time and resources, vulnerability, transparency, accessibility to others, and to know people and be known by them. This is leadership. It’s the capacity to forgive those who have wrong you in your innocence. It’s the ability to walk the extra mile with them in order show the love of Christ. It’s the aptitude of demonstrating continuing patience, when they are undeserving. Forgiving our enemy allows us to see the potential which Christ has placed in them and pray accordingly. Our prayers will bring the conviction of God upon them. At the same time, forgiveness does not demand our becoming a floor mat for an enemy to step on. Loving confrontation tempered with forgiveness is a must. A good leader juggles forgiveness and godly confrontation all at one time. A good leader makes himself accessible to those who he leads. He is not the high and mighty man of God. Jesus , was a “ normal Joe” and so must we. Jesus was never too busy for people and so must I. Where there are cows, there is sure poop in the stable. If we want a program driven church where few are given a chance to grow we might not have much poop. If you want a tidy church, then don’t disciple. If you don’t care for the poop, don’t take a chance on raising up others. Stay with your tightly controlled programs. But if we are relationship driven and want to raise others, we must be ready for the poop to come. Revival is messy. Revival is relational. 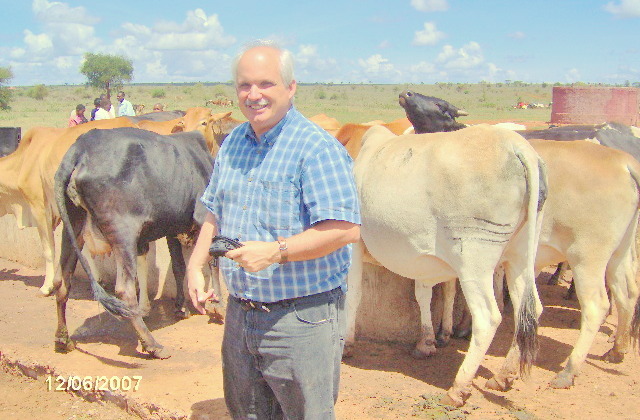 Revival involves the cattle. Good leaders must be willing to get their hands dirty with spiritual poop. If you simply want to prophesy to the poop and stay clean you are are missing the higher calling. If you run away from the poop without attempting to clean it up first, you are also missing God’s higher purpose. I am risk taker with the God-given potential of those around me. Love, belongs to those who relinquish control, who pioneer, and replicate themselves into others. Love belongs to those who pass the baton and push themselves out of a job for the sake of upcoming generations. Many will run away from the problem, but who will remain and solve it? This is the mark of a leader. A minister can have a ministry and gauge his or her success through the ministry, but God is not satisfied with that. It’s impossible to accurately judge a situation without entering into relationships and spend time with the people who created it. I have discovered that I can only adequately judge a situation when I have spent real-time and involvement with the people who are in it. Some will complain about an person, but very few will spend time to mentor and disciple that person. This is the call of the hour. As I grow older, I am convinced that healthy church growth will only occur with relationship minded people. I feel that people are tired of “churchiness” and are looking for relationships, reality, loving confrontation to their brokenness and ample forgiveness for their sins. I am tired of meetings just for meetings sake. I think that God is as well. At a baptism in Maasai Land, Maashuru, Kenya. The Magical Mystery Toilet In the Corn Field Potty Tour. Ndeda Island is a Kenya landmass of fishermen in Lake Victoria. This huge lake is Africa’s largest. It is renowned in part for its abundant yield of brown bass and tilapia. 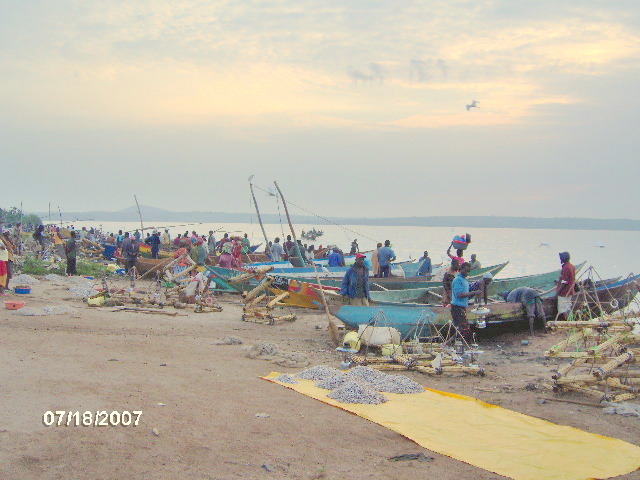 The 10,000 who live in Ndeda Island catch the fish and haul it to coastal towns such as Kisumu where it is sold. 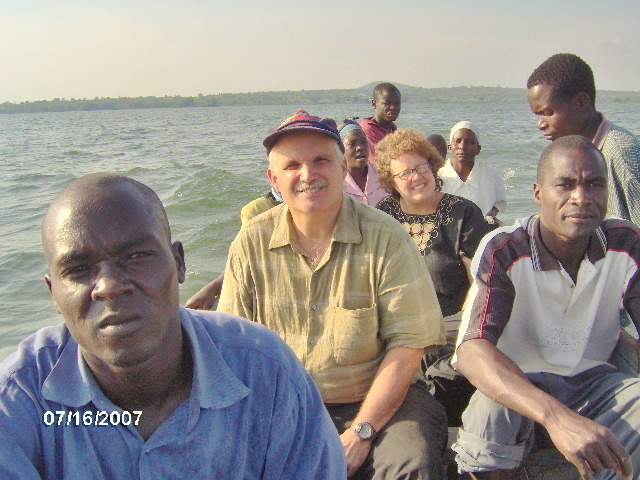 Mary, my wife, and I, were invited in 2007 to host a Bible conference on this bustling island. Upon our arrival to the shores of the island, most of its children hurriedly gathered around our boat. For most, they had never seen a white person (mzungu). We were a novelty, a new toy for them to play with, and for the next five days, they were glued to us. 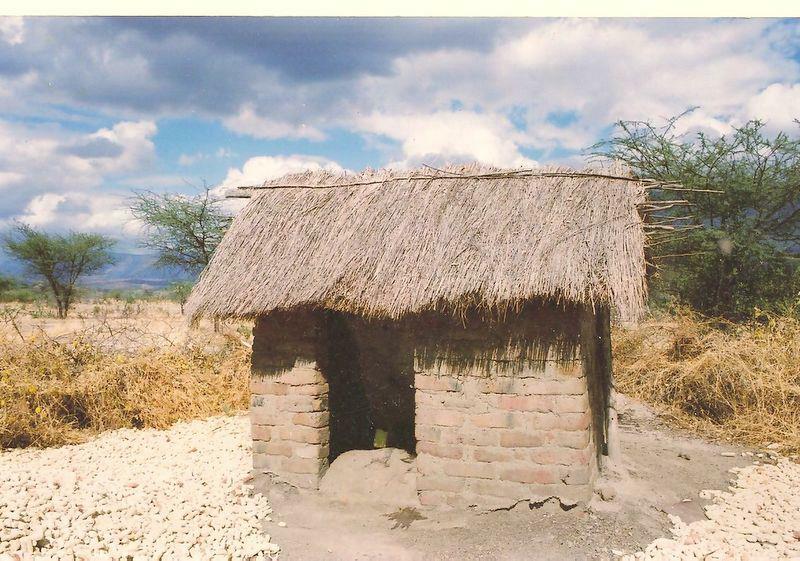 I was sadly informed that Ndeda Island did not have a single toilet ( choo) to accommodate its thousands of inhabitants. Their potty was a vast corn field which also served as food that had been cultivated through human manure. Mary, is genuine missionary. Being part of Youth With Mission in the 80’s, she knows how to rough it, every time and anywhere. Mary was an evangelist in Amsterdam’s red light district, smuggled Bibles into then communist Russia, and served Bogota’s street kids, los gamines. I, however, am a tourist missionary. 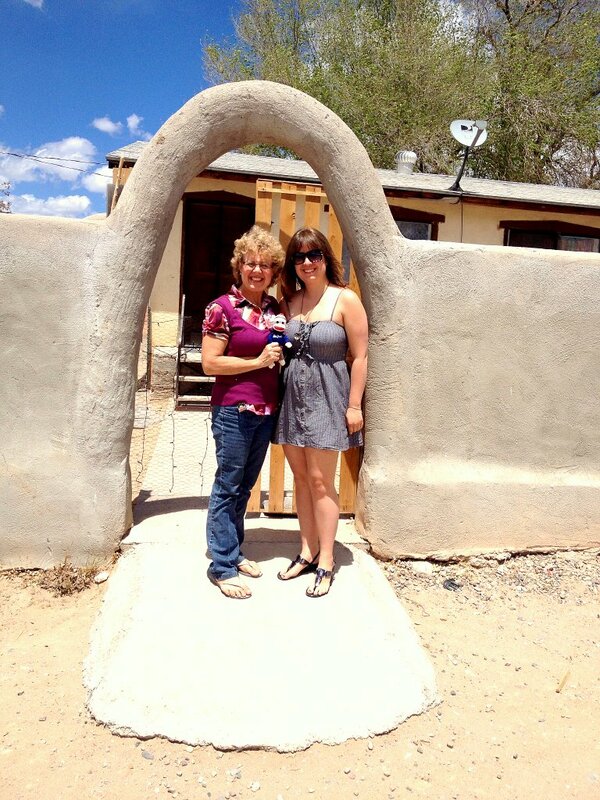 I love the mission field but do need hot baths, and American toilets if possible. I don’t like eating weird food as well. I tried to wrap around my brain the concept of how do 10,000 people go potty daily in one corn field? It wasn’t long till I found out. What I discovered, I would not wish on my worst enemy. This was a mine field of excrement. Separating one husk, and one tree one from another, I could not find a two by two square feet space that was free from human feces. Every other stride was met by yet another horribly dirty deed that must be sidestepped. It was the most ghastly sight ever. I did my number one and rushed out of the horrid field. It was unfathomable to think of going back into the corn husks, and this time to squat. I am a tourist missionary after all! For Mary, this was not a problem. That night with flashlight and toilet paper, she nonchalantly skipped back into the trees like Mel Gibson did in “ Signs”. God is rich in mercy! Hallelujah! 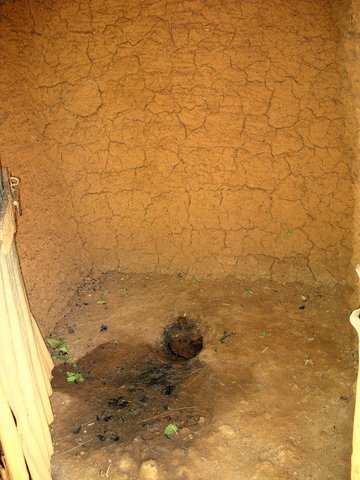 Reports came to us that the one choo, the only real toilet in Ndeda Island, would open for its first business day the next morning. Indeed this was a magical toilet! All this transpired as we stepped onto the shores of the island. Such is the walk of faith, where God splits the Red Sea as you step into it. But, you must step into it! For every visit to the magical toilet it was three Kenyan shillings, equal to two cents. We woke early the next morning and proceeded up the hill to the potty with toilet paper in our hands. The entourage of kids caught glimpse of us and quickly assembled behind like ducklings. What a sight! Two wzungu ( white people) toilet paper in hands, going to the choo, and trailed by twenty kids. This choo was clean and fresh. We gave the lady who managed it our three shillings and were grateful to God for the rest of our visit to Ndeda Island. This magical toilet is the rich man’s potty . Not many have the three shillings to spend on a choo and continued fancying the corn field potty. As for me, I gave every member of our evangelistic team 21 shillings so they could relish seven visits to the Magical Mystery Toilet In the Corn Field Potty Tour. And no, these are not strawberry, but corn fields, forever! Going Potty in East Africa is a Walk of Faith. Warning: If you don’t like reading funny but kinda gross bathroom stories, please stop right here! 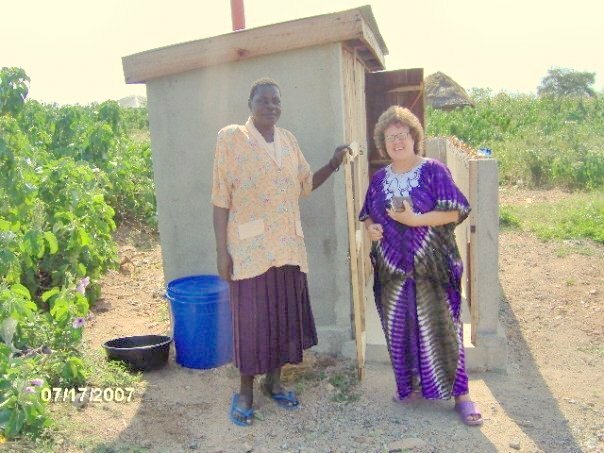 On of our first mission trips to Kenya in 2004, we were escorted to the pastor’s toilet. Walking outside his flat I came to a little wooden outhouse. I opened the door expecting the luxury of my America toilet. Behold, there was a little ceramic hole carved in a concrete floor. I was shocked. What was I to do? I had preached and had slacks, a long sleeve shirt and a neck tie. Of my many choo tales, I’d like to share two. The Maasais are the folks with the big ears, the big earrings, the lion hunters and blood drinkers. They are also some of the globe’s nicest people and a nation which God is touching poignantly with revival. Daily, are Maasais being added unto the Lord. I was invited to teach a Bible conference in the heart of Maasai land in Simba, Kenya. 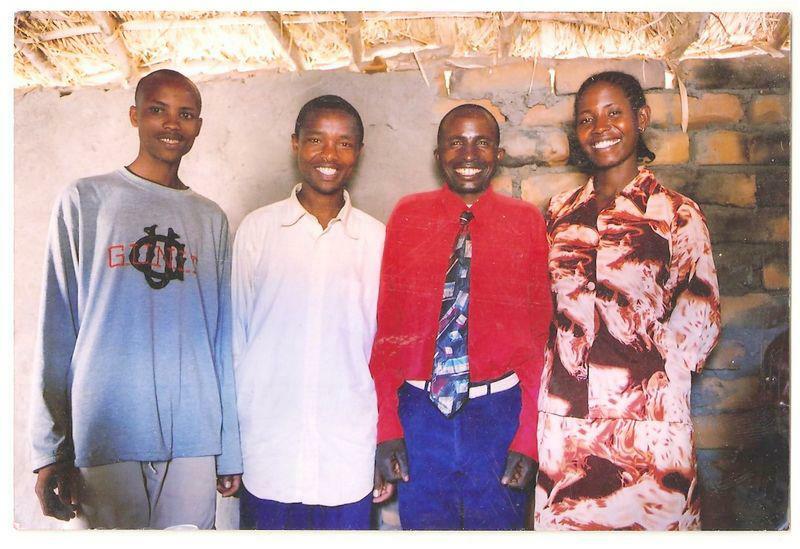 I was met by pastors on the highway to Mombasa, Kenya. After enjoying cold sofdas ( soda baridi) we commenced our track into the Simba bush and to the pastor’s home. My bags were hoisted on bicycles. The savanna was tall and there were tons and tons of mud ( matope ). Simba had been experiencing nonstop rains for weeks. Today, was to be no different. The skies above were menacingly black. As we went, the heavens split and down came the blinding rains. No umbrella, no trees to hide beneath, just mud and flowing gullies of water all around. I was soaked to the bitter bones. All that we could do was to get more and more drenched. In ankle deep mud, we lugged and dragged until our arrival to his cow dung hut. As the rushing rains continued , his wife met us with towels. I went into my tiny bedroom and changed everything including my water logged handkerchief. Now this pastor did not have a choo. His choo was the bush. Tonight the walk to the potty would be in drenching rain, ankle high mud, and who knows what kind of night critter to bite me as I bent over. I prayed and made my deal with God. “Ok Lord, I’m going to ask you a big favor,” I conjured my demands to the Almighty. I was done with my prayers and went to sleep in my six by eight foot room. At three in the morning, I woke up to roar of hammering rains, and an irresistible urge to do Number Two. I could not believe it! “God, I told you that I did not want to do number two for the next five days!” I quipped. The need just got worse and worse. I was angry at God. Now I knew that if I did not proceed to the rain and into the mud I would do number two in my room. Let me teach you some basic Swahili, so that when you guys go to Kenya on your safari, you will know these words. I got my roll of toilet paper and flashlight. The pastor was sleeping in the other room. Dutifully, the pastor rolled the big wooden door aside. I pointed my flashlight into the gaping night, its beams catching the huge drops of rain. As I stepped into the mud, the rain stopped. Bang! From a trouncing down pour to a nothing in sixty seconds flat. I looked up in disbelief. I went to my bush choo full of confidence and did my long col.
My second and more dramatic choo story occurred in Kisangaji, Tanzania. Kisangaji, is even more remote than Simba. 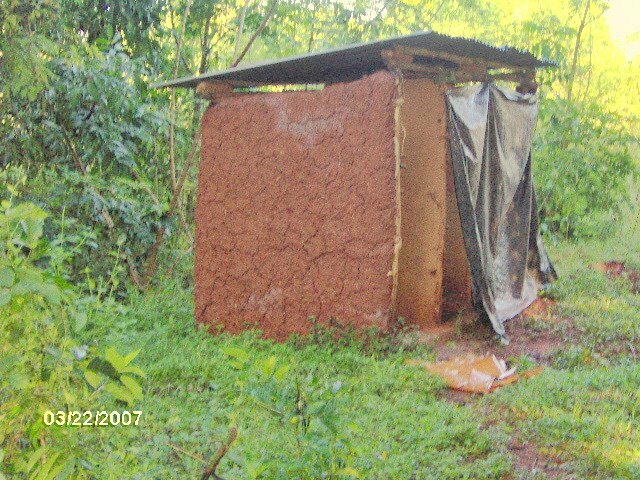 The pastor’s cow dung hut was a couple of miles from the township of Simba. Kisangaji, however, is about 10 miles from the nearest town of Mbati. I was here on a five day Bible conference. In Kisangaji I did not have a bush choo but the regular rural choo which is a hole in the dirt inside of a tiny structure. I did not pray what I had prayed in Simba, but my wish was just as strong. What made it extra tricky was that our food for five days , was, ahhh yes, rice and beans. Beans, beans and more beans. Everything, was so far, so good. It was Sunday, the fourth day of the conference. I was heading out to Arusha the next morning. No urges for long col. Praise Him! After the Sunday morning service we walked for nearly two miles to a small river in scorching heat. We were to baptize several converts. I muttered under my breath as I sweltered with perspiration running down my face. To my utter amazement, these Tanzanians who had nothing, went on leaping and praising God, drums banging, and voices raised all the way to the river. Africa, has taught me how ungrateful, spoiled and pampered I can be. On the journey back, the crisis hit me. OMG, I got the worse urge to go long col of my whole life. I had no toilet paper, and there were no trees. It was just rocky grounds spotted with occasional Acacia trees. I was bursting and busting. Panicking, I fold one of my fellow walkers. I marched like a high-speed soldier, legs tucked in, frantically doing the penguin shuffle, trying just to make it back to the camp. I spotted my wonderful Tanzanian hostess Teresia whose house I was lodging in. “ Teresia” I gasped, “long col!” She muttered something back to me. “ L O N G C OL!”, I articulated. Little did I know that the Tanzanian Swahili is different to its Kenyan counterpart. She had no idea what I said! I froze in time, now beyond exploding. Suddenly, another pastor rushed to the scene and spoke to her. Teresia grabbed my hand and rushed me to my bedroom. I hysterically dug through my luggage, got the roll of toilet paper and lunged to the outhouse. Breaking in through the roosters and children I must have looked like an utter fool. As I pulled my pants down I sprung for the hole, but did not make it. The diarrhea came out on the floor, all over my pants and my legs. As a penguin I straddled over the hole and finished my business. “ Oh, God, how could you allow this to happen to me?” Squatting over the hole I continued my diatribe with God. I swear that in the midst of my complaints, God sent an angel who tapped the roll of toilet paper, which I had let on a mud ledge inside the outhouse, with his finger. As I looked up, the toilet paper fell off the ledge, magically rolled right towards me, in between my legs, and into the hole! “ Oh My God!” This was the utter low blow! What could I do but put my diarrhea pants back on and proceeded back to the bedroom. Past the children and the roosters I stumbled once again; I was so embarrassed! I washed myself down, put the dirty clothes in a bag and proceeded with them to where the pastors where. Quietly I told them what happened. Laughter erupted everywhere. No one mocked me. It was just so darn funny. In conclusion, the women washed down the choo, and proceeded to stick the dirty clothes down the magical hole. I had my bottle of anointing oil in the pants. The joke was that Kisangaji had been permanently anointed. As I said Going potty in East Africa is a walk of faith! 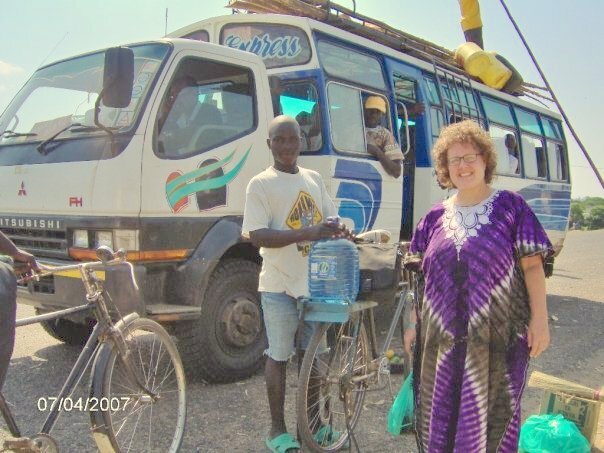 This account of my time in Tanzania took place somewhere in 2006. I just got back from Arusha , Tanzania and hope to share some of the pictures with you on my next update. Arusha is a tourist town close to Mt. Kilimanjaro , the largest mountain in Africa, over 19,000 feet high. To my great dismay in the town of Moshi at the foot of Kilimanjaro, the top of the huge mountain was shrouded over with clouds. My hosts were Bishop Stephen Mbata and his wife Faith who pastor six Mt. Horeb Churches in Tanzania . My first two days were spent in Arusha teaching a seminar. African Christians have a great hunger for the Word of God after receiving many years of preaching but little teaching. We saw powerful manifestations of the power of God especially in healings. People extended the palms of their hands forward and at the slapping of the palms everyone either was flung back or fell down under the power. On Thursday we boarded a bus to Mabati, a town three hours away in rural Tanzania . 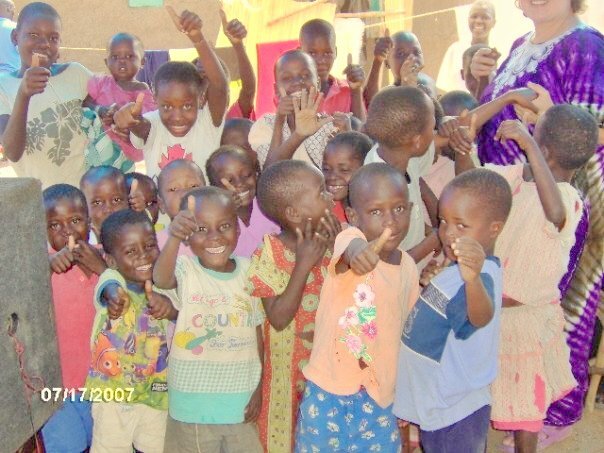 We were to teach four-day seminar in Kisangaji, twenty miles from Mabati, where Mt. Horeb has one of its branches. Upon our arrival, the last bus to Kisangaji had already departed. 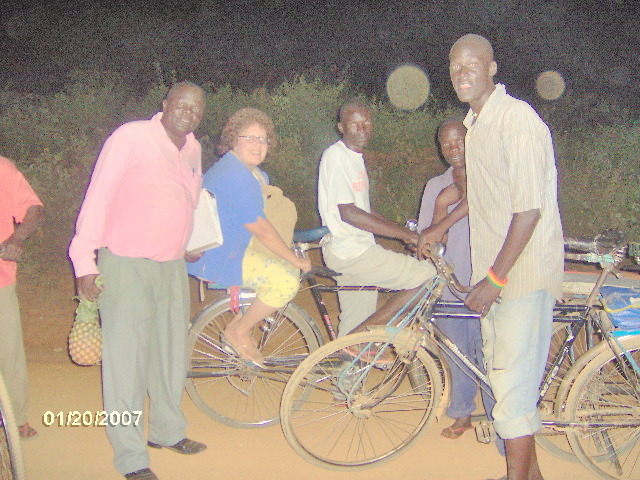 Two bicycle evangelists came to greet us on bicycles, the main mode of transportation in these rural areas. 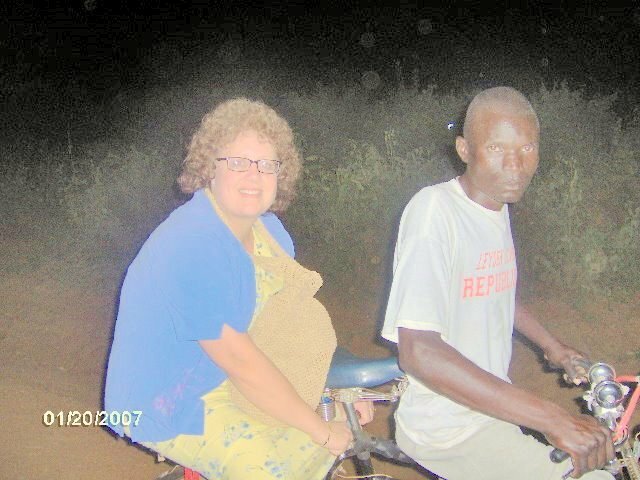 They proposed that I would ride for one hour on the back of a bicycle. I frowned in anger really big at the Lord. I knew that my displeasure was plain to all. Then just like in the account of Abraham and the ram caught in a thicket with the impending slaying of Isaac, I met my Jehovah Jireh. As I lifted up my eyes and looked, a truck that would take Kisangajians to their destination for a small fee was just ready to leave. I was immediately hoisted up and packed in with another twenty people and sat on top of big rice sacks. God gave me a rope to hold on that was tied to a bar on the truck and we all laughed at seeing this white man swaying back and forth like jello on the bumpy roads to Kisangaji.